Hearing the words from your doctor "You have breast cancer" is a major fear after getting a mammogram for millions of women. Each year in the United States, more than 200,000 women get breast cancer and more than 40,000 women die from the disease. Cancer is a disease in which cells grow out of control. When cancer starts in the breast, it is called breast cancer. Except for skin cancer, breast cancer is the most common cancer in American women. Because of personal and family medical history, some women are at higher risk for breast cancer. 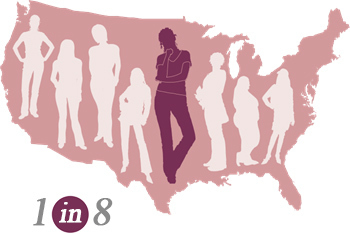 About 1 in 8 women born today in the United States will get breast cancer at some point. Who should get a mammogram? What age should you get your first mammogram? What might be some ways that can lower your risk of getting breast cancer? The USPSTF recommends that women who are 50 to 74 years old and are at average risk for breast cancer get a mammogram every two years while women aged 40 to 49 years old should talk to their doctor or other health care professional about when to start and how often to get a mammogram. The American Cancer Society has recognized October as breast cancer awareness month and hold events nationwide to walk in support of breast cancer awareness. 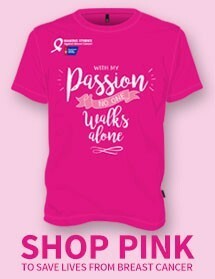 Walk participants raise critical funds that enable the American Cancer Society to fund innovative research; provide free information and support to anyone touched by breast cancer; and help people reduce their breast cancer risk or find it early when it's most treatable. For more information about how you can participate in fighting the war on breast cancer, visit the American Cancer Society website. Can I get a mammogram if I do not have insurance? What can I do to ensure that I am cancer free? Mammograms are covered by most insurance companies. Low-income, uninsured and underinsured women across the United States can get breast screening and diagnostic services through The CDC's National Breast and Cervical Cancer Early Detection Program. Many state Medicaid programs, such as Louisiana, also cover breast cancer prevention, diagnosis and treatment. Join Americans across the country in fighting breast cancer which affects so many women and men in our country. Your help in the fight through participation, awareness and donations can help us stamp out this disease that takes the lives of many Americans each year.